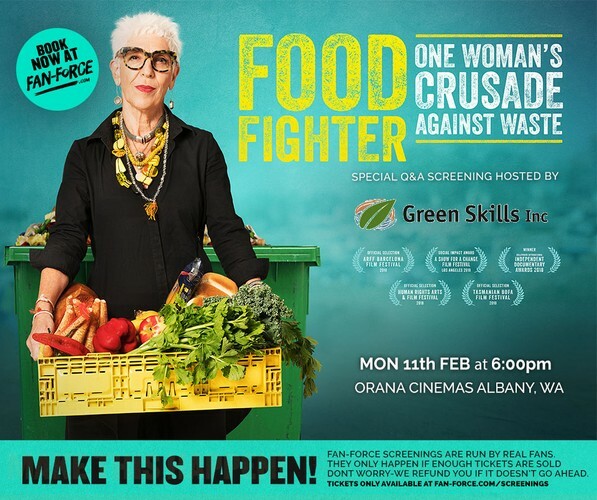 Green Skills Inc. brings you this special screening of Food Fighter! The film will commence at 6pm sharp, so please arrive at least 15 minutes before to take your seats. Ronni Kahn used to be a contributor to Australia’s annual $20 billion food waste bill when she ran a successful corporate events company producing million-dollar dinners. Then she realised the absurdity of throwing away perfectly edible food, trading capitalism for social activism by founding OzHarvest, a food rescue charity, in 2004. Filmed over two years and across four continents, ‘Food Fighter’ follows Ronni’s crusade against the global food waste scandal, partnering with the United Nations in Bangkok, rubbing shoulders with British royalty and Jamie Oliver’s juggernaut in London, and holding big business and the government to account in Australia. Please note: Enough tickets must be sold to ensure this screening goes ahead, if it doesn't happen those funds will be refunded—no one loses out! To buy tickets, click on the tickets link above. This event is supported by the Waste Authority of Western Australia.